For just $1, you could win Florida's original jackpot game FLORIDA LOTTO®! Jackpots start at $2 million and roll until there is a winner, with drawings held twice a week. This game has produced more than 1,000 jackpot winners and you could be the next. Players can add EZmatch™ for the chance to win instant cash and/or add XTRA to multiply their non-jackpot cash winnings by two, three, four or five times. Win Now and Win Later! With EZmatch™, you can add instant fun to FLORIDA LOTTO! Just choose the EZmatch play option, for an additional $1 per play for a chance to win cash instantly. 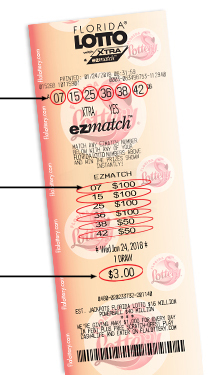 When you select EZmatch, six EZmatch numbers and instant prize amounts will print below the FLORIDA LOTTO numbers on your ticket. Match any EZmatch number with any FLORIDA LOTTO number on your ticket, and win the prize amount shown instantly. You can win up to six times on a single FLORIDA LOTTO with EZmatch ticket. 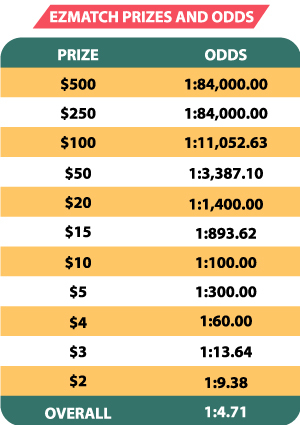 Prizes shown are estimated prize amounts. All cash prizes are pari-mutuel. The XTRA number, from 2 to 5, will be drawn at random just before the FLORIDA LOTTO drawing to determine how much the non-jackpot cash prizes will be increased for that draw. ** For FLORIDA LOTTO with XTRA players, the odds of matching 2 of 6 numbers are 1 in 8.58. The XTRA 2-of-6 prize is a free FLORIDA LOTTO with XTRA Quick Pick ticket for the next available draw. *** The overall game odds for FLORIDA LOTTO with XTRA are 1 in 7.61. The Florida Lottery will hold official FLORIDA LOTTO® drawings in which six out of 53 numbers will be drawn at random. If your six numbers match the six winning numbers drawn in the official drawing for the date played, you win the FLORIDA LOTTO jackpot. Match three, four or five of the winning numbers to win other cash prizes. Players may choose to receive their portion of the FLORIDA LOTTO jackpots in a one-time Cash Option payment or in 30 annual payments. The Cash Option payment is the amount required on the day of the drawing (or if the drawing is held on a Saturday or holiday, the business day prior to the drawing) to fund the applicable jackpot prize paid over 30 years, less applicable taxes. FLORIDA LOTTO jackpot winners who want to receive a single Cash Option payment must claim their prizes within the first 60 days of the 180-day redemption period. Applicable federal income taxes will be withheld from both Cash Option and annual payments at the time payments are made. Read more about claiming Lottery prizes.